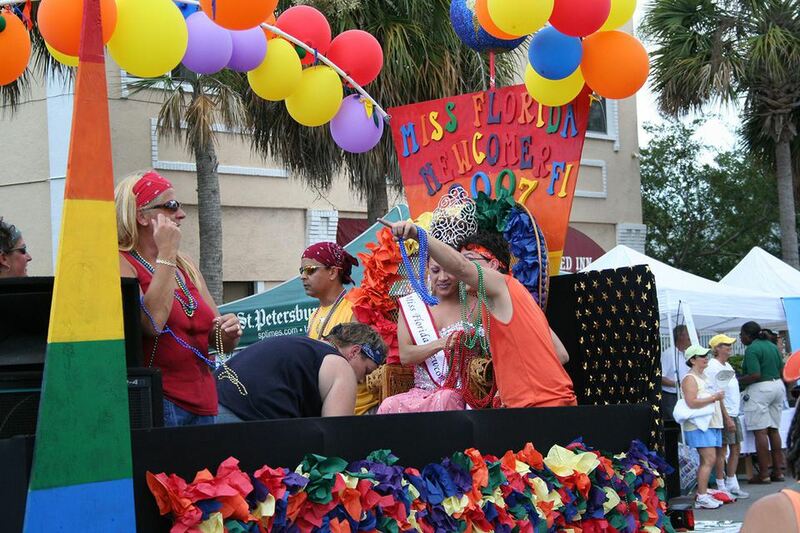 Where might you expect to find the largest Pride celebration in Florida? You may be surprised to learn that it's not in Miami, Fort Lauderdale, or even Orlando. Rather, Gay Pride St. Petersburg, known as "Pride Carnivale," throws the Sunshine State's biggest Pride event. What began less than a decade ago with a modest tally of some 13,000 attendees has blossomed into a major festival, now drawing in excess of 200,000 participants and spectators. St. Pete Pride takes place at the end of June (June 24 thru June 26, 2018) and draws folks from throughout the St. Petersburg, Tampa Bay, and St. Pete Beaches region. Note that across the bay, Tampa Gay Pride is held in late March each year. In St. Petersburg, Pride celebrations center around a handful of events throughout late June, culminating with a street festival and parade on Saturday, with a number of cool events leading up to the big day, including a Pride Day @ Tropicana Field to watch baseball's Tampa Bay Rays on Friday, June 17. The major weekend of St. Pete Pride includes the following big events. Saturday late afternoon kicks off with the St. Pete Pride Block Party and Pride Parade, taking place from 5 pm until 11 pm. The celebration, with more than 150 vendors, food providers, and GLBT organizations, runs along Central Avenue between 22nd and 28th streets. The action culminates on Saturday evening, at sunset, with the night-time St. Pete Pride Parade. This colorful Gay Pride parade runs through the city's hip Grand Central District, starting at Georgie's Alibi gay bar and running along Central Avenue through historic Kenwood. On Sunday, the free St. Pete Pride Festival is held in the same place as the previous day's block party, between 22nd and 28th streets along Central Avenue, from 11 am until 6 pm. You'll find that many gay bars, as well as some other area businesses, have special events and parties throughout Pride Week - here's ​a​ guide to the best gay-friendly accommodations in the St. Pete and Clearwater region, if you need some lodging ideas, and here's a guide to finding St. Pete's popular gay beach, which will also draw big crowds this weekend. Check local gay papers, such as Watermark for details. Also take a look at the excellent GLBT site produced by the city's official tourism organization, the St. Petersburg & Clearwater CVB.